IIFA 2017 is just around the corner and many B-town celebrities have already been taken over by its madness. Most of them are already in New York where the big night is scheduled for July 15 and 16 at MetLife Stadium. We have already seen pictures of Shahid Kapoor, Mira Rajput, Sushant Singh Rajput, Anushka Sharma, Virat Kohli and Kriti Sanon, among various others, who are splendidly enjoying their time in New York. 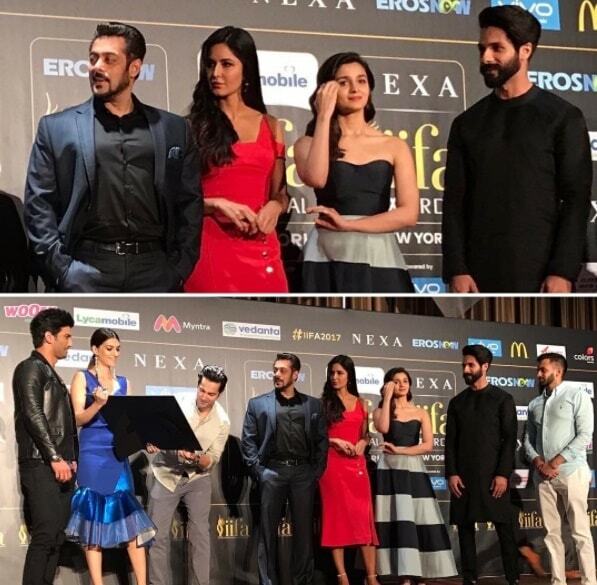 Every year IIFA steals the national attention to its stage with the rocking performances and dance numbers by doyens of Bollywood like Shah Rukh Khan and Salman Khan, and in IIFA 2017 we have the younger lot like Varun Dhawan, Sidharth Malhotra, Alia Bhatt, Kriti Sanon who are going to create an extravaganza. But it seems like 'Tubelight' actor Salman Khan is all prepped up to make IIFA 2017 synonymous with him as he is stealing the limelight in the most adorable manner. Salman Khan gave a surprise gift to his ex-girlfriend Katrina Kaif when he sang "Happy Birthday Katrina Kaif" for her. "I am very bad with dates… The only date I remember is Katrina’s birthday"
After this, Salman Khan started singing for Katrina Kaif who will celebrate her 34th birthday on July 16. And that’s also the reason for Katrina Kaif not attending the IIFA 2017. Later in the night, when Katrina was asked about her one memorable thing that she did when she was 18, she replied- "I met Salman." On being asked what his plans are for Katrina’s birthday, Salman added- "It’s not a national event. Indian me to chutti hai, ab US me bhi ho jayega (It’s holiday in India, hopefully it happens in the US too)"
Just recently Katrina had also posted a picture on Instagram holding a Disney-themed caked captioning it as cake number 3. She is celebrating her birthday in advance it seems. One of the fan pages resource out that even Ranbir Kapoor bought her a birthday cake, captioning it- "JAGGA JASOOS 's team celebrating @katrinakaif 's birthday in advance 🎊🎉🎂. ● 3 DAYS TO GO FOR #jaggajasoos & 5 DAYS TO GO FOR KK BIRTHDAY"
On the work front, it is to be noted than Salman Khan and Katrina Kaif will be seen together in the upcoming film 'Tiger Zinda Hai'. Katrina is also busy promoting 'Jagga Jasoos' along with Ranbir Kapoor.